There is rummaging in the kitchen. The sound of water hums through the pipe and gushes out the faucet; an electric tea kettle is being filled for my husband’s morning tea. 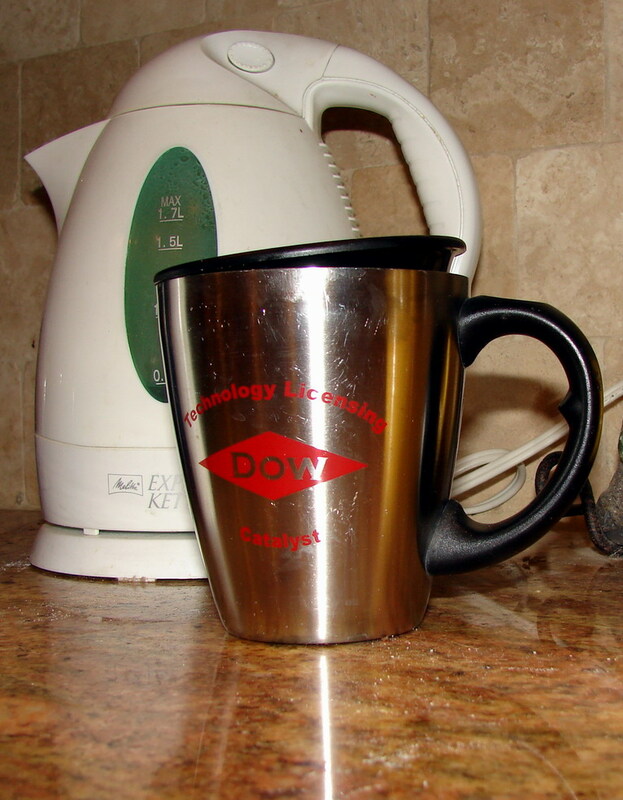 Cabinet doors open and out comes a thermal mug with the red Dow Chemical diamond logo on it. I no longer remember how we came by these mugs. Yet, we have three, exactly alike. Perhaps like other red diamond stuff accumulated over the last thirty-two years, these mugs were a recognition award. However they came to us, this trinity of stainless steel mugs work together to become my husband’s sacred vessel for tea. As the water begins to boil, he retrieves a tin of green tea; his fondness of this pale tea grew out of frequent travels to Asia. He pinches together a few loose leaves and carefully tosses them into the bottom of the mug. Soon the boiling water will flood the cup and leaves will swell. The tea will steep as I stir from sleep. My husband’s early morning tea ritual is my everyday wake-up call. The sounds of water boiling in the tea kettle climb the stairs to nudge me from sleep. I slowly stretch my legs to dislodge the stiffness from my knees, a sure sign of age creeping upon me. The subtle action dislodges more than intended; my three young and exuberant canine companions bound up on all four legs. Instantly awake, they stretch and yawn while moving themselves in range for a few morning pets. I open my eyes to find our standard poodle Max staring up at me with hungry and hopeful eyes. To encourage me awake, and maybe even to express his undying love, Max quickly plants both feet on the bed and leans in for a sloppy French kiss. Dulled by sleep and slower reflexes, I dive for the covers but Max is too fast. That poodle boy shakes this canine mom from her dream world every time. What had I been dreaming? It’s hard to remember, though sometimes, if I ask myself the question while still drowsy, I can recall enough to make me smile. But with three hungry dogs and a full day of no plans ahead, I’ve no time to dawdle now — it’s time to turn my back on my bed and my dreams and wake up to everyday life. A new day is ready to be born and I must go deliver it. Cathy is starting young for knee replacement. I’ve always heard that the test if readiness for replacement is when the daily pain of no replacement is worse than the pain from surgery. Hope all goes well with her recovery. There’s this cat I live with… Every day at 5 a.m. or so, it starts. Miaow. I get up, put a handful of food in the bowl, click on the furnace if it’s needed, click on the coffee pot and dive back in bed. When the coffee’s done, if I’ve fallen back asleep I get another few miaows. If that fails, a dozen trips across the bed at full tilt usually does it. Routine IS wonderful. Comforting like the well worn pajamas after many many washings. Nice that your cat has a snooze alarm feature.